Whether you are an active person, weekend warrior or a competitive athlete, Emory Sports Medicine Center treats athletic injuries for people of all ages. Emory Sports Medicine has locations across the greater metro Atlanta area, providing Emory quality of care right in your neighborhood. Our locations include Brookhaven, Dunwoody, Smyrna, Johns Creek, and Spivey Station in Jonesboro. Emory’s physicians and therapists see a high volume of athletic injuries each year, resulting in some of the highest patient satisfaction scores in the country. It’s also why the Atlanta Falcons, Atlanta Hawks, Atlanta Braves and the Atlanta Dream trust Emory Healthcare to care for their athletes and call us their Official Team Healthcare Provider. We also care for kids involved in athletic programs at more than 20 high schools, as well as college and league sports teams. Emory Sports Medicine Center also offers medical evaluations, physical therapy, exercise counseling and innovative surgical treatments to help you get the care you need to return to an active lifestyle and prevent future injuries. Fill out this form to schedule an appointment at a location near you. 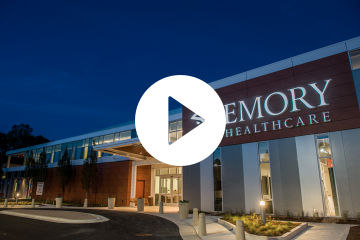 See inside Emory Sports Medicine Complex, a joint partnership between Emory Sports Medicine and the Atlanta Hawks.